Step 1 Bring water to a boil in a large pot. Once boiling, remove from heat and stir in sugar, then add tea bags. Step 2 Allow the tea to cool to room temperature, 2 to 3 hours. Remove the tea bags, then pour the tea into a 1-gallon glass jar. Gently pour scoby and starter kombucha into the jar. Step 3 Cover the jar with a paper towel or clean tea towel and affix it with a rubber band. Place the jar in a warm (the ideal temperature is 75°F), dark location until it is tangy and fruity, about 8 days. Avoid cool locations, which can lead to mold. Note: During fermenting, the scoby may float on top or sink to the bottom and, after a few days, a new scoby layer will form. Step 4 After 8 days, taste the kombucha for doneness. If it tastes sweeter than you prefer, allow the kombucha to ferment for another day or two. If necessary, continue tasting for up to 14 days until the desired flavor is reached. Step 6 Pour the kombucha through a fine-mesh strainer into a pitcher or large measuring cup(s) to filter out any sediment. Using a funnel, pour the kombucha into sealable glass bottles. Tip: Kombucha scoby is widely available online. Starter kombucha is simply kombucha from a previous batch. If this is your first time making kombucha, starter kombucha will be included with your purchased scoby. 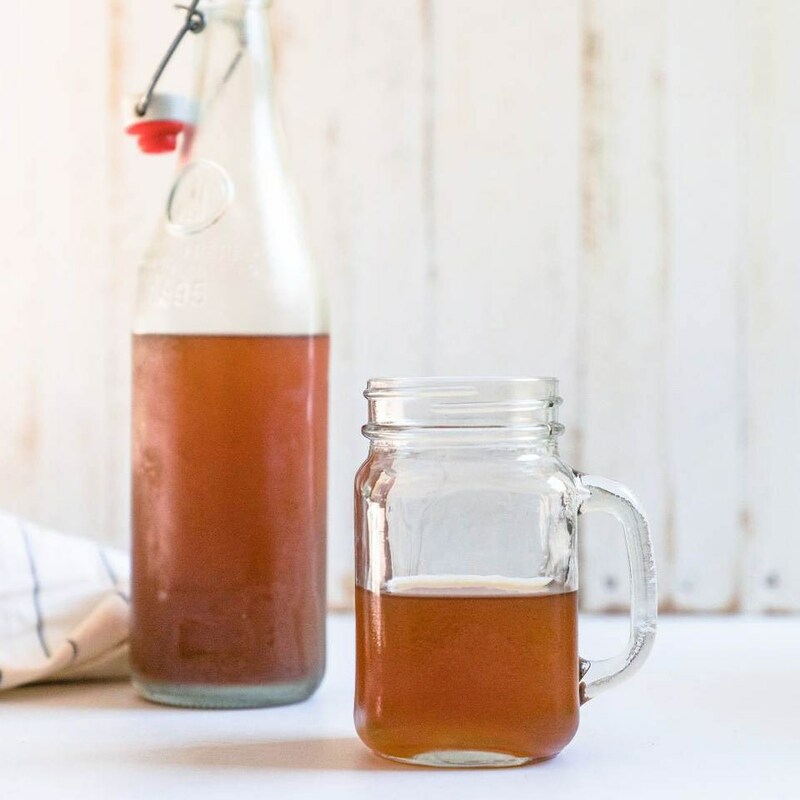 Equipment: 1-gallon glass jar, paper towel or clean tea towel, rubber band, funnel, fine-mesh strainer, sealable glass bottles To make ahead: Refrigerate kombucha for up to 2 weeks.